The sun is shining! Woo hoo! That means it’s time for another holographic polish. Gotta love this! I needed just one coat to reach full opacity (no top coat). No dragging, no bald spots. Way the go, Dance Legend! The photo below is taken in sunlight. People from Russia sure know how to make holo’s, color shifters and thermals! 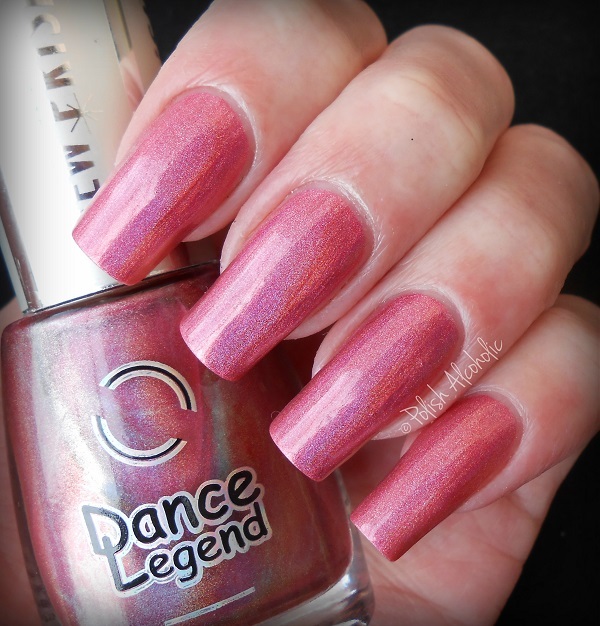 Do you have any Dance Legend polishes? This entry was posted in Dance Legend and tagged dance legend, dance legend holo, dance legend new prisms, dance legend prisms, dance legend shock, holo, holographic, nail polish, pink, review, swatch by Polish Alcoholic. Bookmark the permalink. Ahhh that s*cks! You should though! The DL’s that I’ve tried so far are absolutely worth having! 😀 50+? Woo hoo! I’m so jealous! I only have one dance legend and I love it soooooo much! Helemaal geweldig! Ik moet ook nodig een bestelling gaan plaatsen. Helemaal mee eens! DL is fantastisch! Haha good question! 😉 I hope you’ll find some though because they’re lovely!